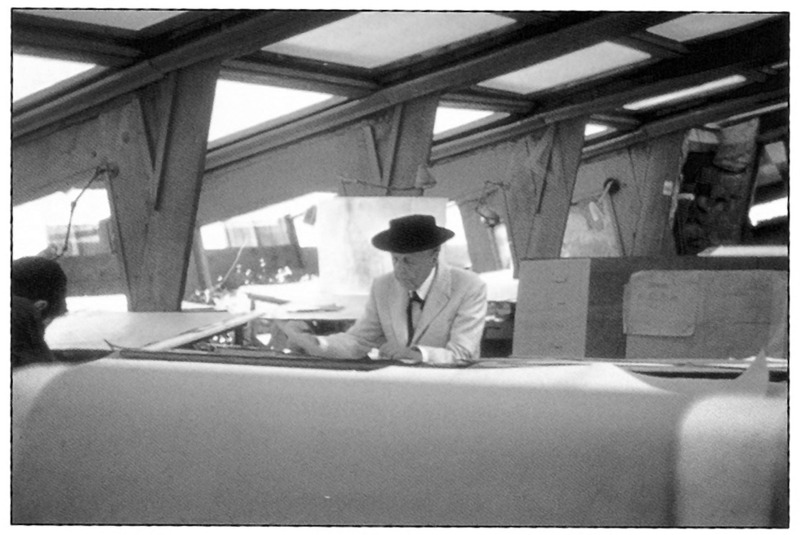 History: Frank Lloyd Wright arrived in Arizona in 1927 at the invitation of one of his former students, Albert Chase McArthur, and never really left. 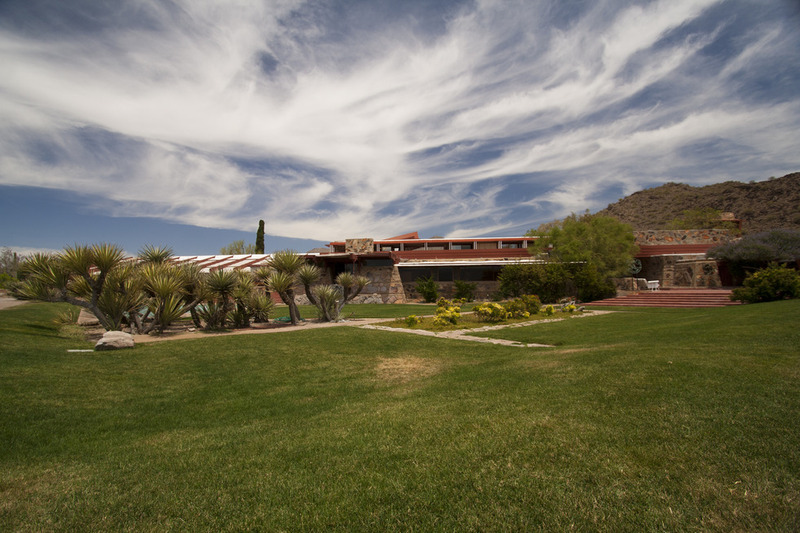 A consulting role on McArthur's Biltmore Hotel project was parlayed into a major commission by Dr. Chandler for the San Marcos-in-the-Desert development intended to rival the Biltmore (see => Wright in the Ahwatukee Foothills ). 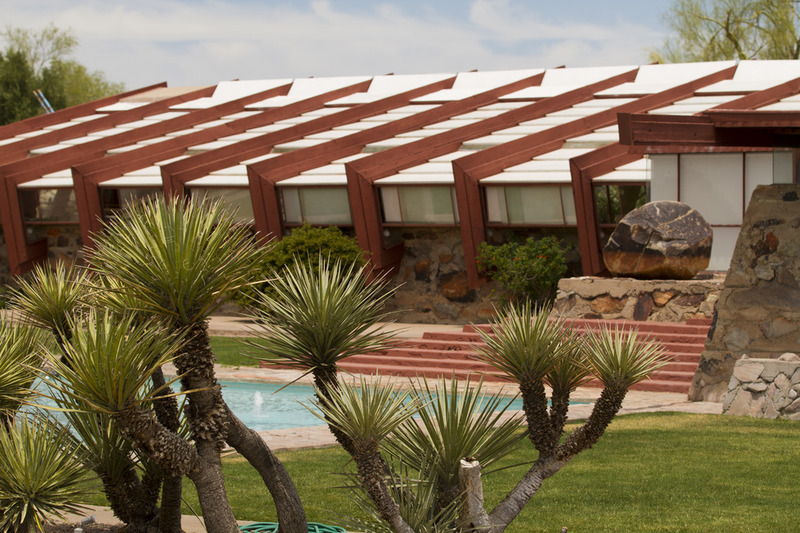 From Camp Ocatillo located in present day Ahwatukee, Frank Lloyd Wright spent almost 2 years in the desert formulating the plans. 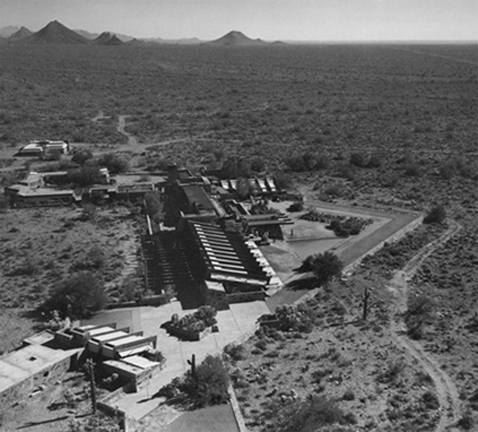 Although the 1929 stock market crash scuttled the San Marcos-in-the-Desert project, the Sonoran Desert left an indelible grip on Wright. 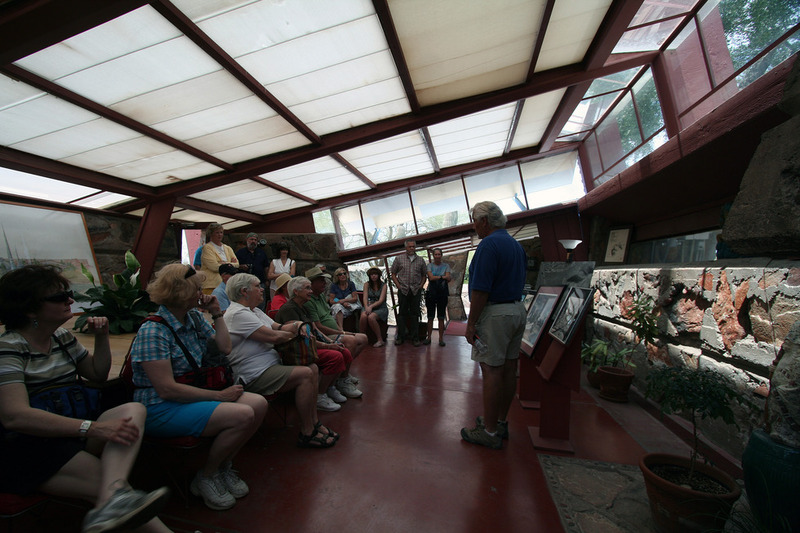 He began scouting potential sites for a winter home during his annual treks to the desert with his architectural school students and in 1937 settled on a southern slope of the McDowell Mountains. 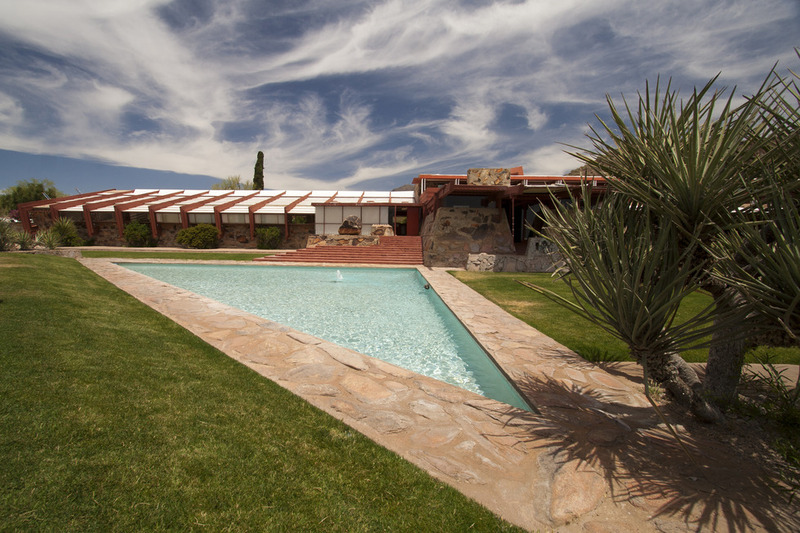 Having completed one of his most famous commissions, Fallingwater for the Kaufmann family, Wright used the money to purchase 640 acres at a cost of $3.50 an acre (that's $2240 total purchase) on the outskirts of Scottsdale. Wright described it as such; "Finally I learned of a site twenty-six miles from Phoenix, across the desert of the vast Paradise Valley. On up to a great mesa in the mountains. On the mesa just below McDowell Peak we stopped, turned, and looked around. The top of the world." 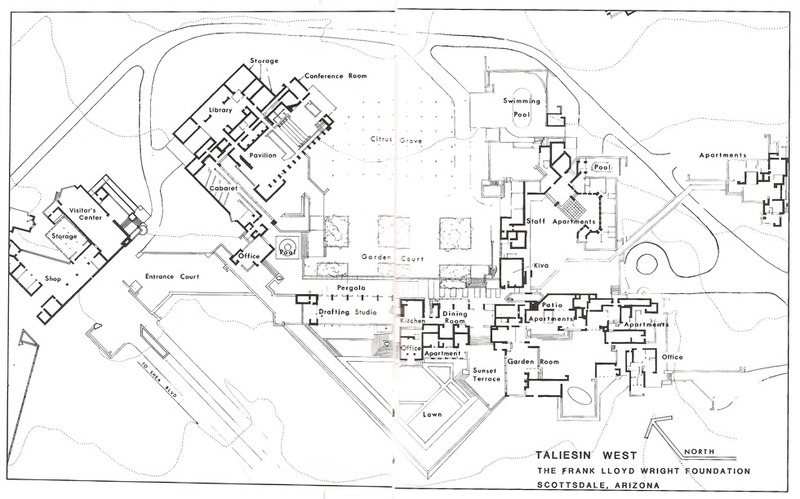 Plans for Taliesin West began to take shape and the complex was constructed piecemeal starting in 1938 when the first ground was excavated and the first roads constructed. 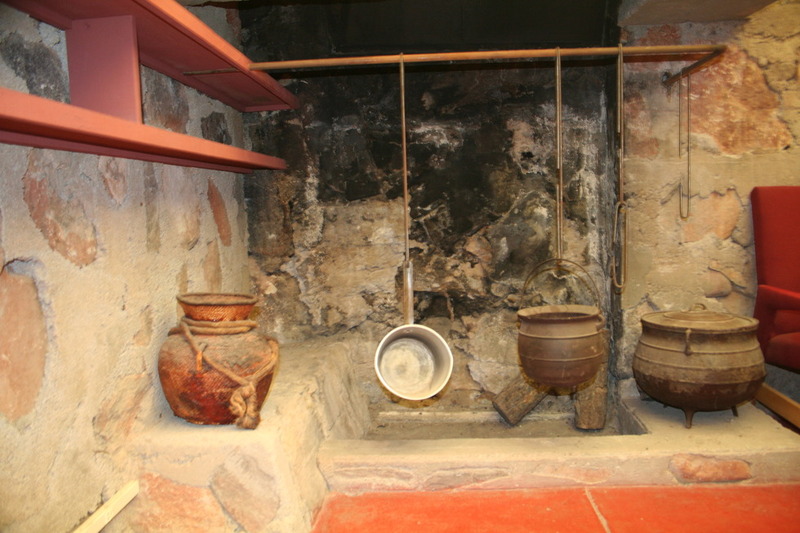 Conceived of as "the camp," the center of a way of life dedicated to architecture and based on the life of the Taliesin Fellowship, the first room constructed was the drafting room followed by the kitchen, dining room, apprentices' apartments, Wright's office, and finally the "Kiva," a half-submerged underground chamber based on the dwellings of the Pueblo Indians. Rustic as the setting was, however, it was a space devoted to beauty and culture. In the early 1950s, when the Kiva proved too small to accommodate the expanded activities, a larger playhouse was built - the Cabaret Theater. Here they enjoyed formal dinners on the weekends with movies and music following. 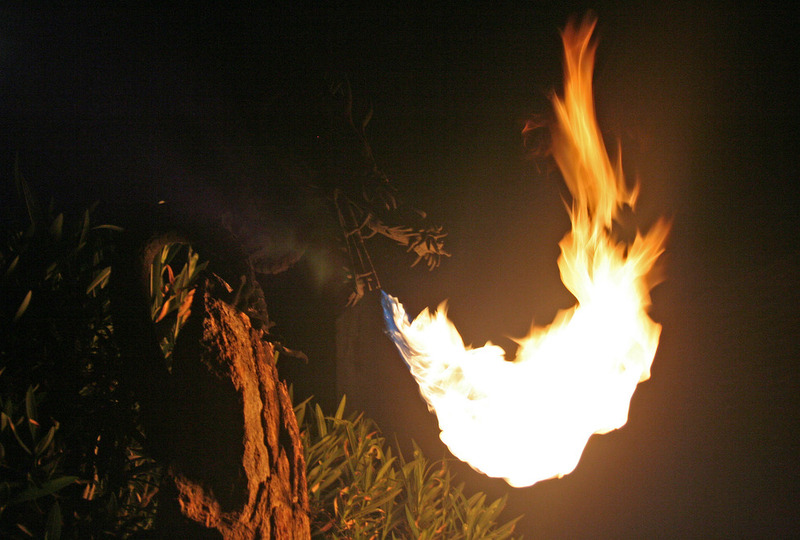 A camp-like atmosphere was carefully constructed by leveraging open-air with no glass whatsoever. 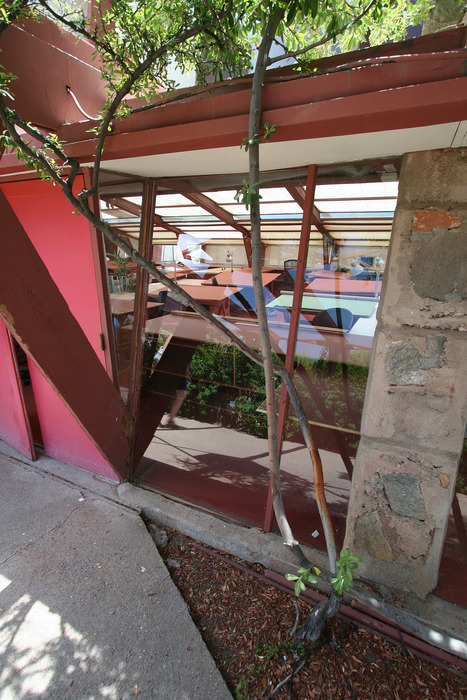 Wright did change his mind later on as he eventually enclosed certain areas that had been open to the elements with glass, taking care, however, to miter the edges of the glass together to maintain an unobstructed view of the outside. 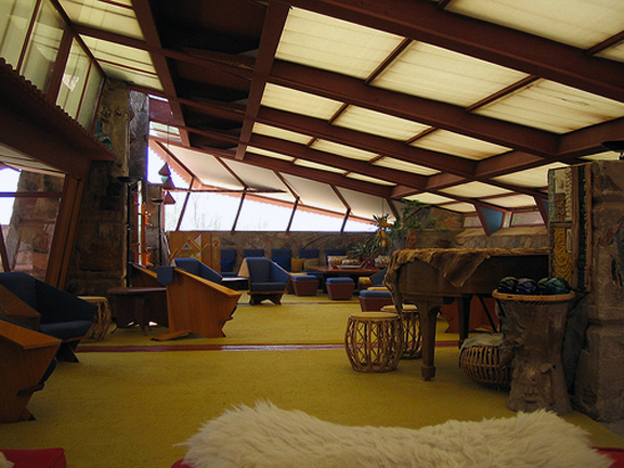 Wright believed interior space should not be cut off from but reflects and integrate the exterior. 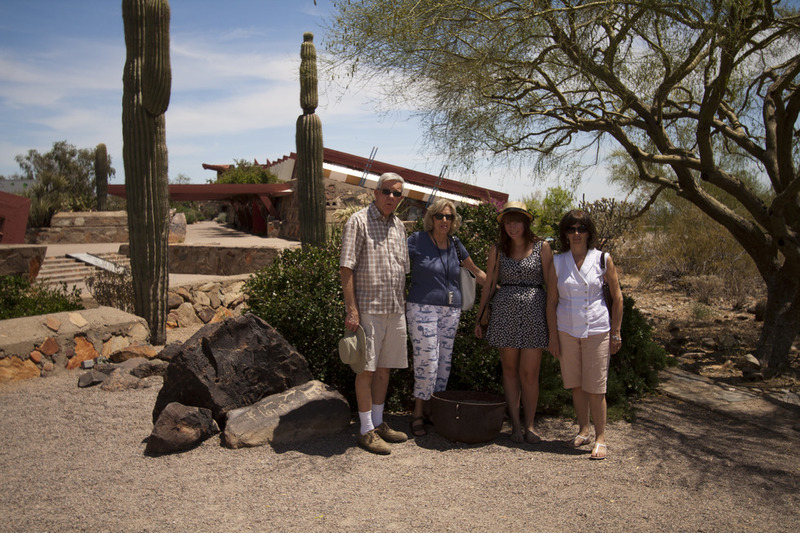 Taliesin West maintains a strong connection to the desert Wright declares; "Arizona needs its own architecture... Arizona's long, low, sweeping lines, uptilting planes. Surface patterned after such abstraction in line and color as find "realism" in the patterns of the rattlesnake, the Gila monster, the chameleon, and the saguaro, cholla or staghorn - or is it the other way around--are inspiration enough. The structure's walls are made of local desert rocks, stacked within wood forms, filled with concrete." 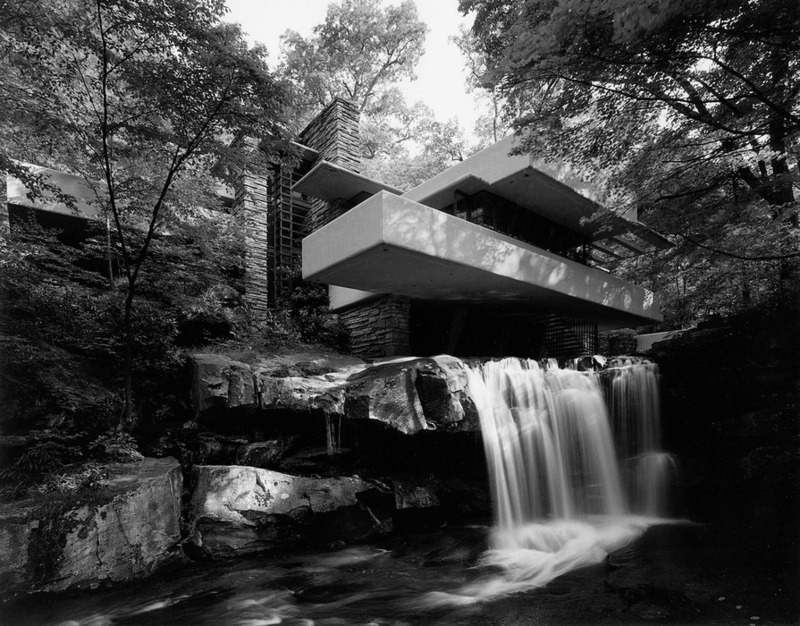 Wright always believed using the materials readily available opposed to those that must be transported to the site - hence "organic architecture"! 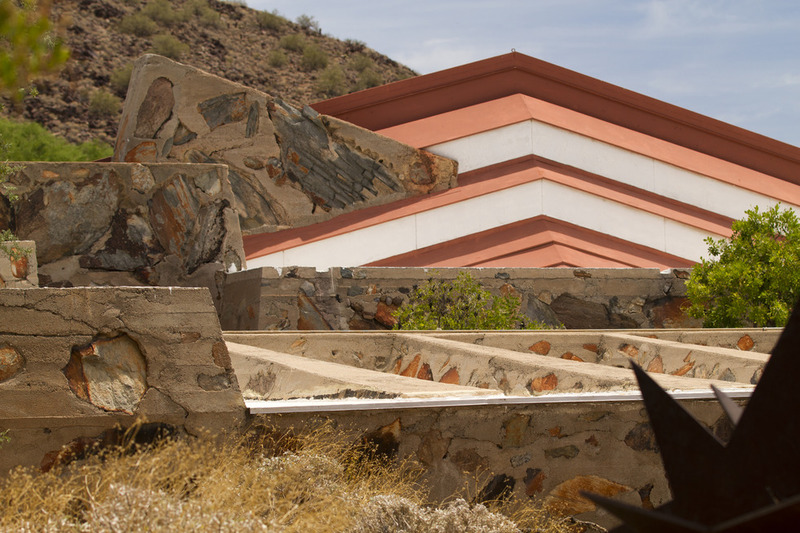 Completion would prove to be an elusive word as Frank Lloyd Wright was continuously altering and improving Taliesin West until his death in 1959. 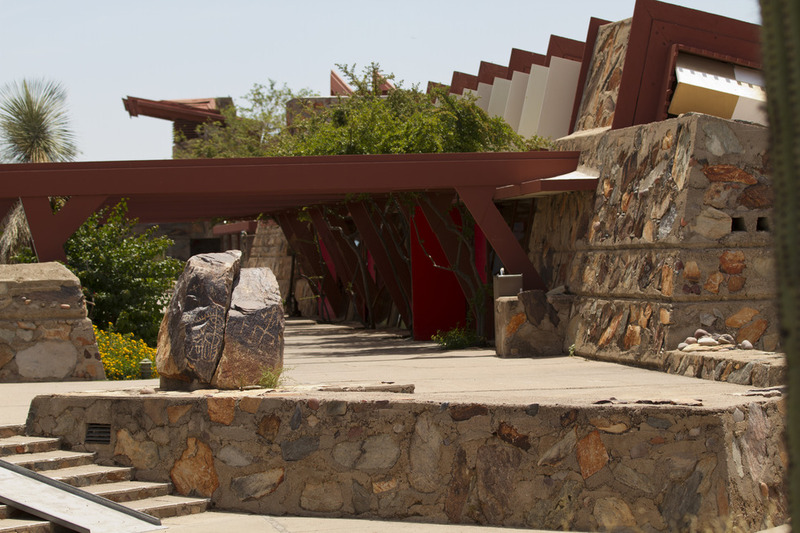 Hike: Options are limited to only guided tours of Taliesin West. 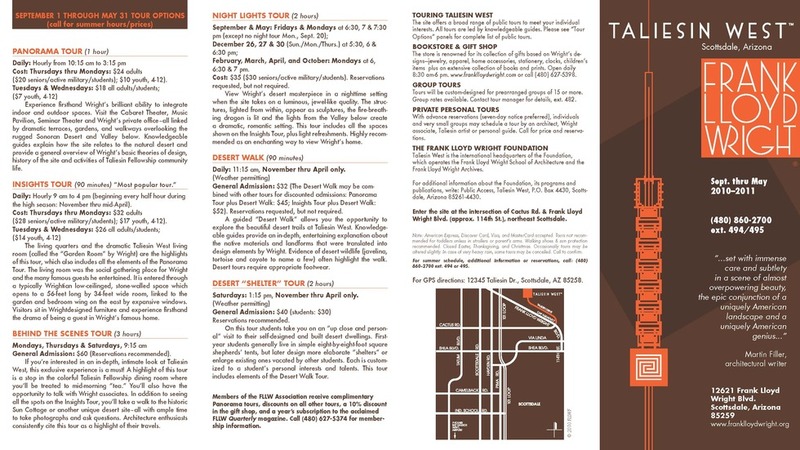 I've personally been on the "INSIGHTS TOUR", the "NIGHT LIGHTS TOUR", and the "DESERT WALK". All are recommended. Tip of the day => rates are reduced on Tuesdays and Wednesdays. 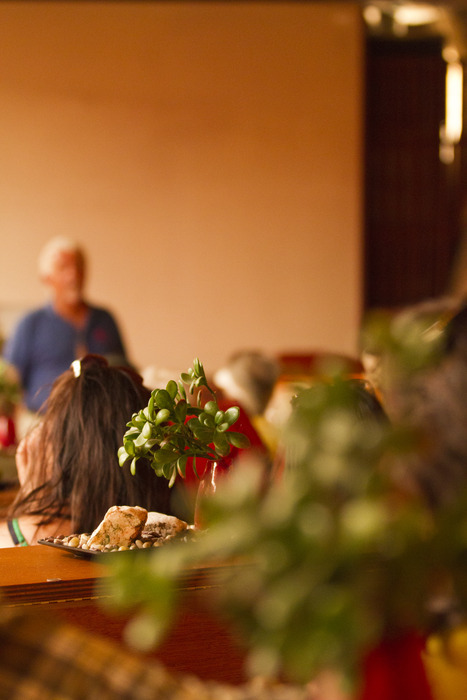 Start at the Visitor Center where you'll meet up with your knowledgeable Tour Guide. 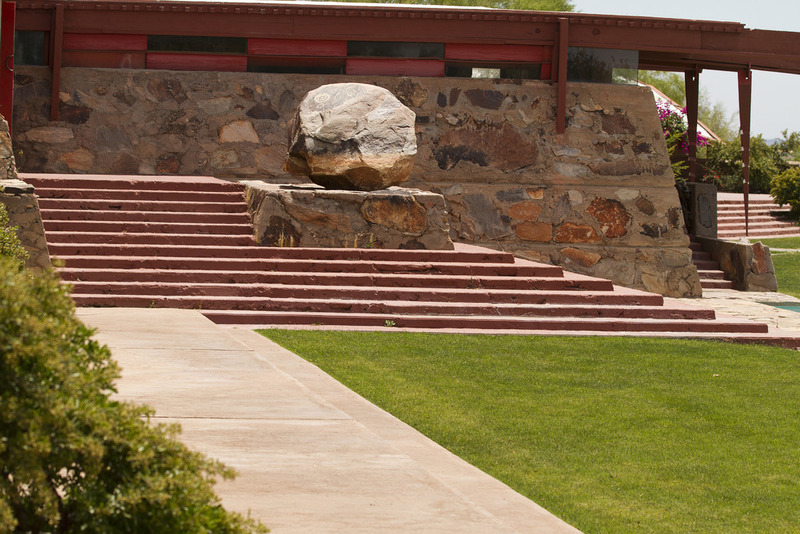 Onto the Entrance Court where your first FLW history lesson begins. Walk into the Office where you get your first taste of FLW interior appointments and use of natural light. As you exit the Office, you notice the need to hunch over as you pass through the doorway. 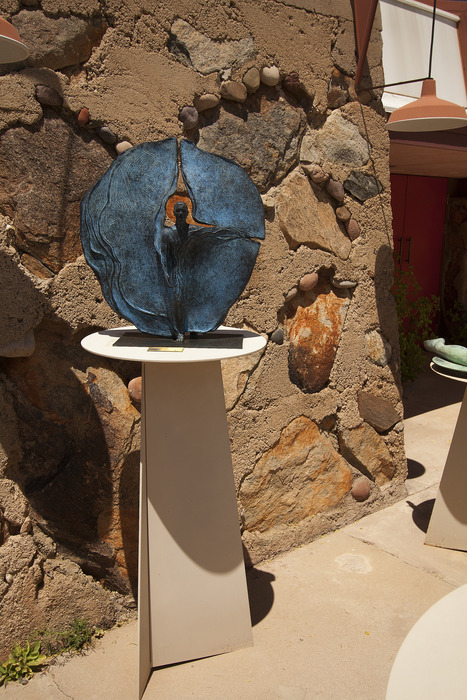 This is a consistent feature at Taliesin West, an FLW ploy to hurry you into the room. 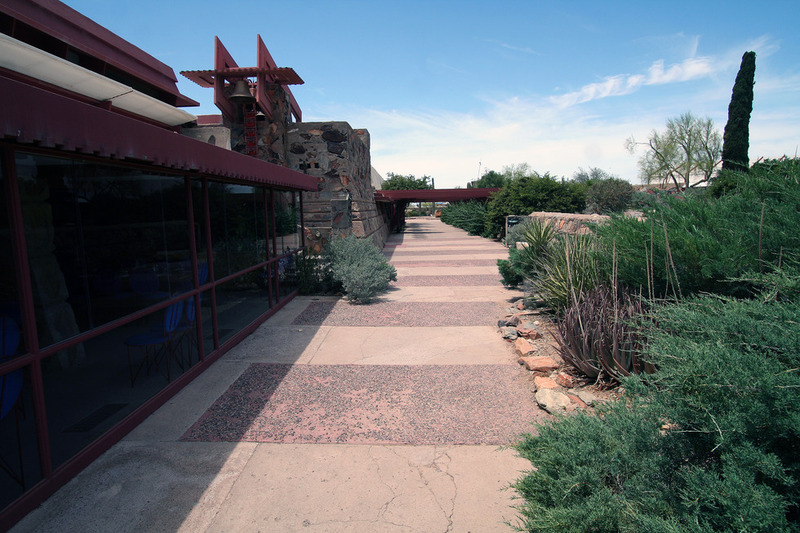 Walk along the sidewalk towards the Lawn at the extreme southwest of the complex. 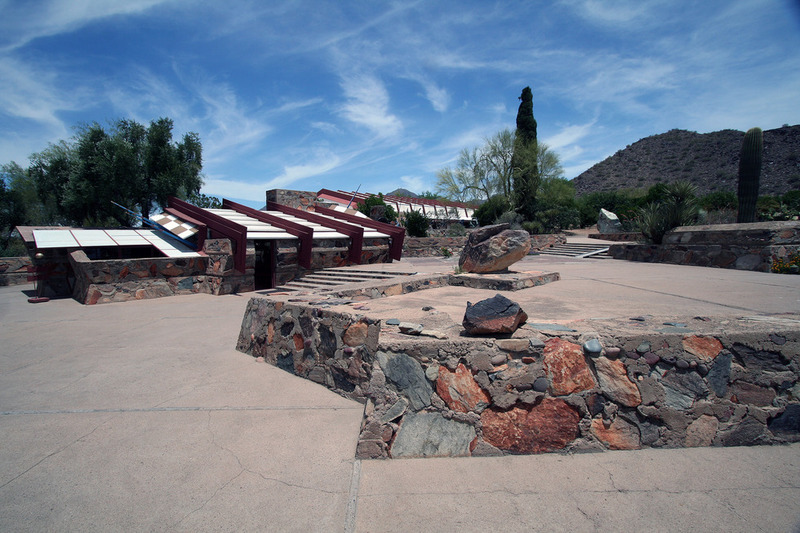 To me, these are the most iconic views of Taliesin West. Continue up the Sunset Terrace and into the Garden Room. This is personal favorite of mine with the eclectic art collection and trademark furniture. Interesting to see how the glass was all installed without moving any of the art work back in the 1940's. 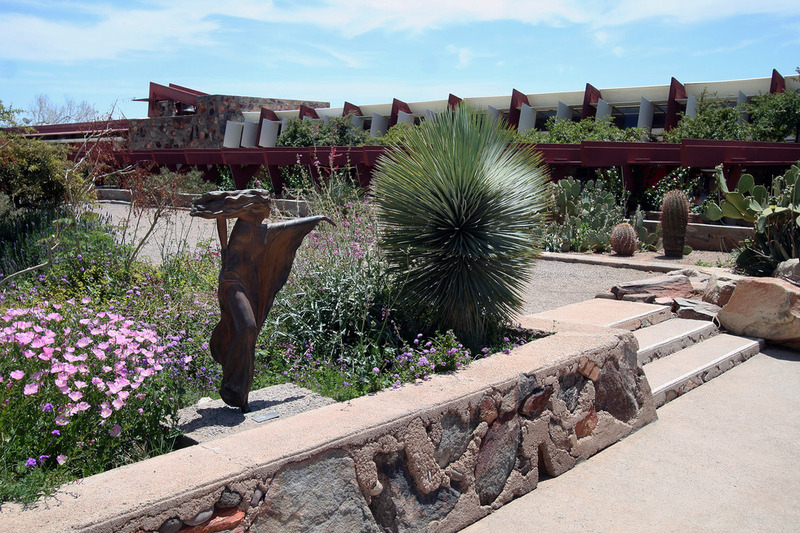 After visiting the Garden Room you are taken to the separate patio apartments of Olgivanna and Frank Lloyd Wright. FLW's patio apartment is a library/office where he frequently worked late into the night. 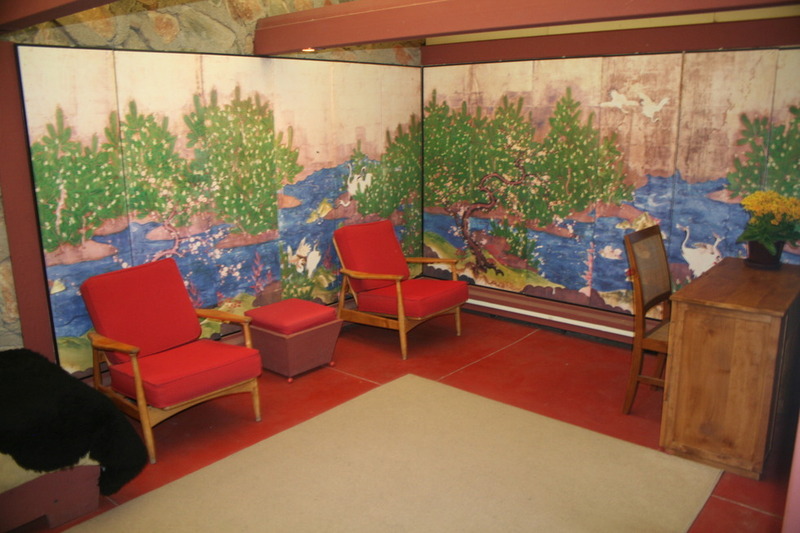 Most of the books I examined in FLW's patio apartment were collections of Oriental Art. Next up is the Kiva Room. 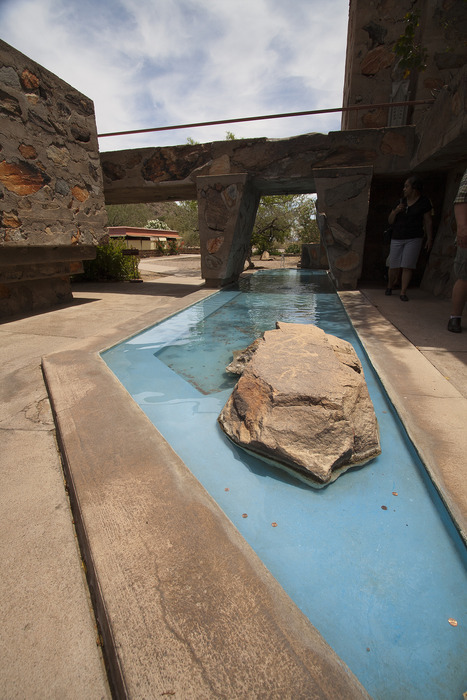 You pass a fountain with Hohokam rock art scavenged from the Taliesin grounds. 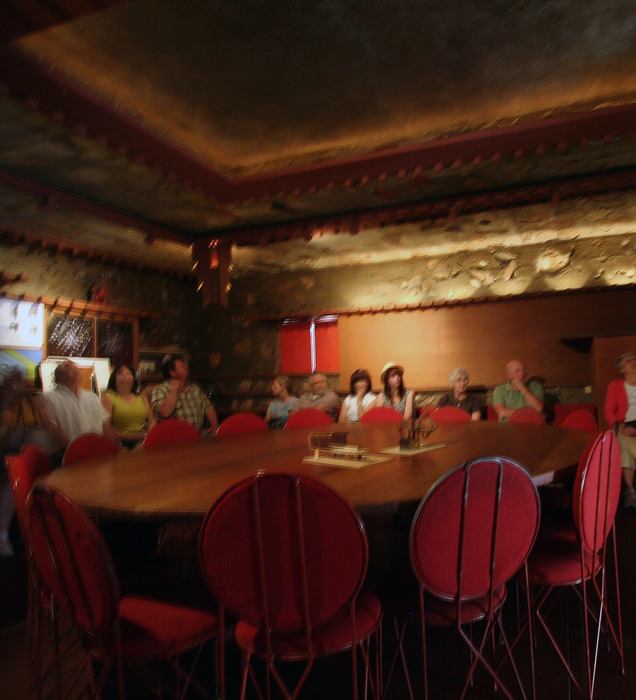 The Kiva Room doubled as a conference room and a movie theatre for the Taliesin Fellowship. 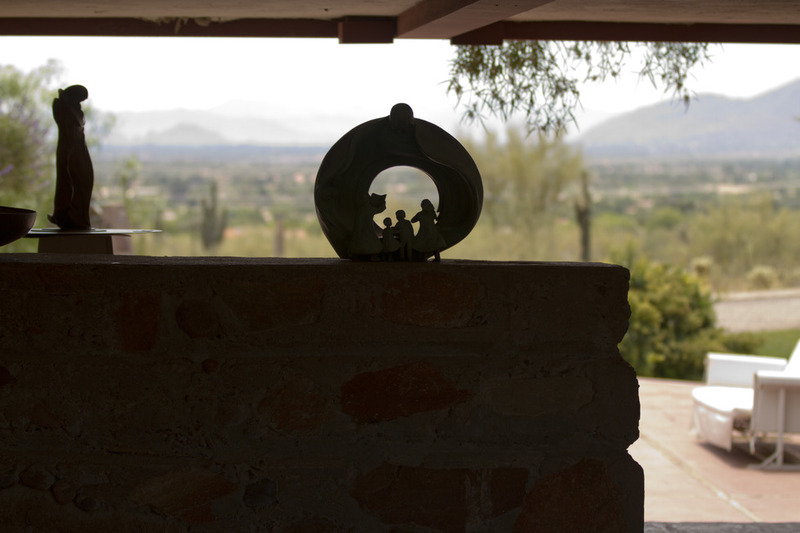 From the Kiva Room you pass the Sunset Terrace with it's natural breezeway and the Dining Room. 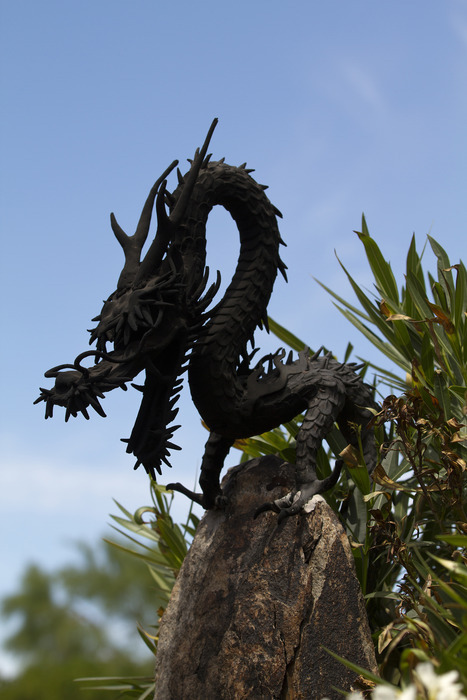 A rather unique dragon sculpture overlooks the breezeway by the Dining Room. The walkway continues past the Drafting Room. 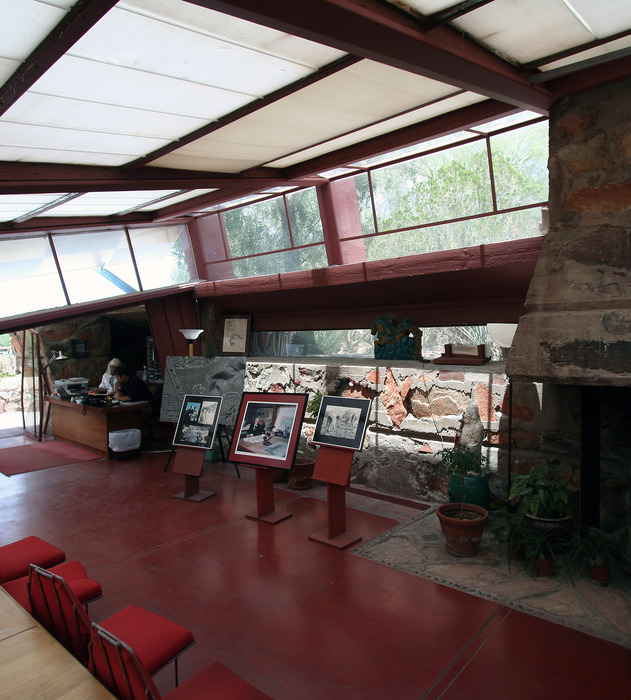 Interesting how form follows function for Frank Lloyd Wright since the Drafting Room was the first room constructed at Taliesin West. The Pavilion Room and Cabaret Room are the last stops on the tour sandwiched between inspecting all the patio sculpture. 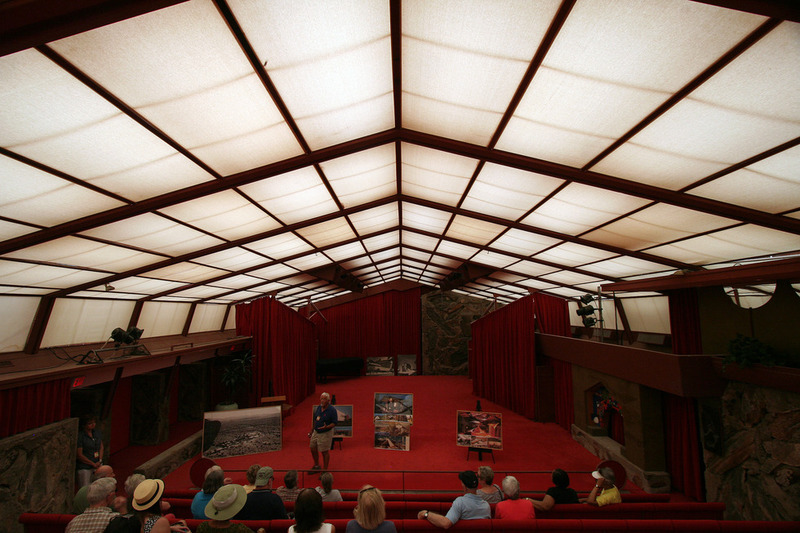 Summary: I've always been fascinated with the life and times of Frank Lloyd Wright. 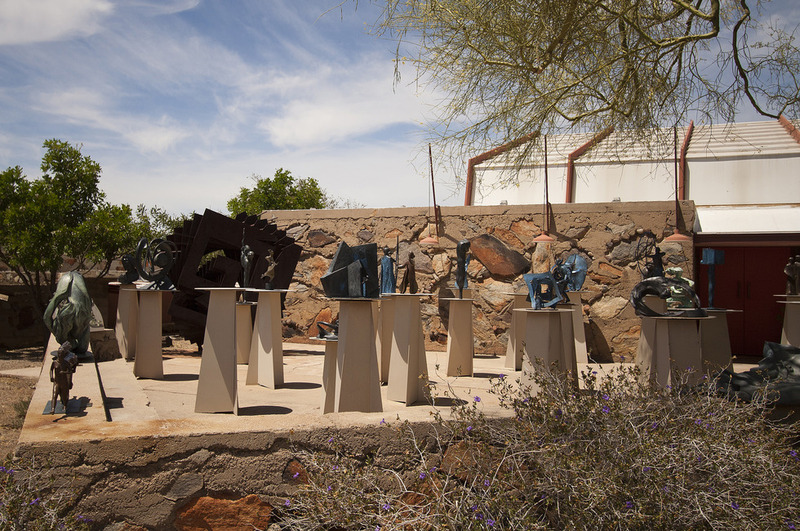 After completing this trek, a visit to "Wright in the Ahwatukee Foothills" almost seems mandatory! Enjoy! 1. 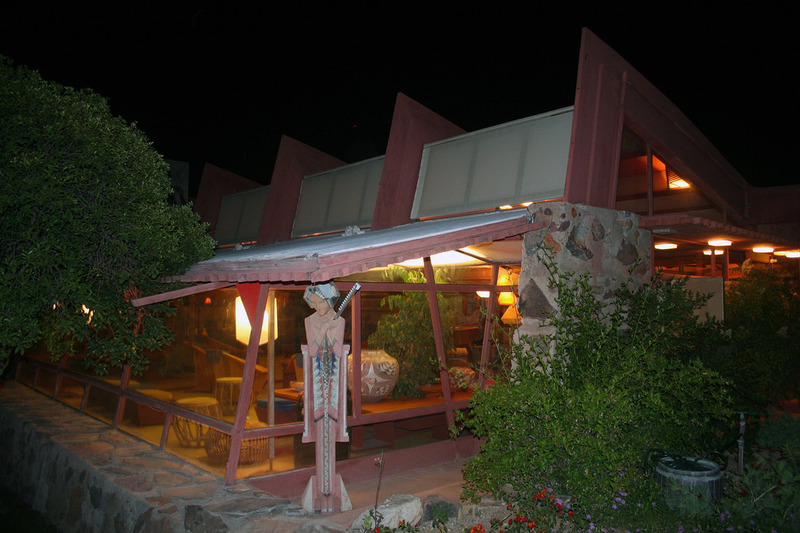 Take Loop 101 until you reach Frank Lloyd Wright Boulevard. 2. 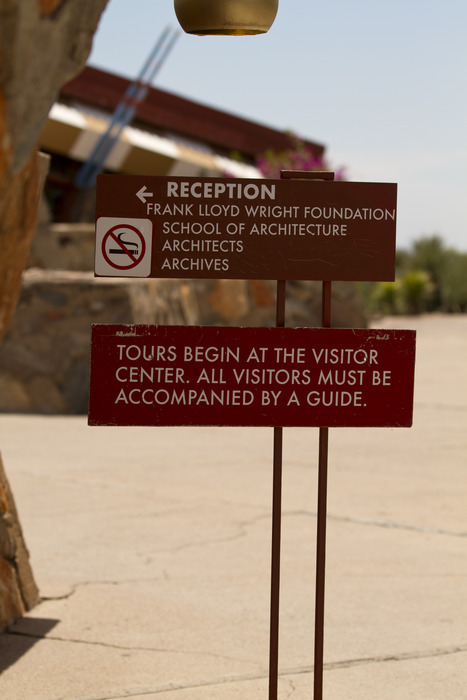 Travel east on Frank Lloyd Wright Boulevard until you come to the intersection of Cactus Road and follow the signs to Taliesin West.